Sue Cesare remembers how brutal the Great Recession was – how it took nearly everything she had. She was an independent facilitator and trainer in the automotive industry making an average of $80,000 a year but working about six months. That left her time to travel, time to paint. She would go to the Detroit Auto Show, corporate Christmas parties, and get wined and dined. In August 2007, it all came to a jarring halt. She had just completed a training contract with BMW when she noticed no more work was popping up. In the past, she hadn’t really had to seek work, it found her through her corporate contacts and network of fellow facilitators. Over the next few years, she worked a hodgepodge of jobs to try to make up for the income she lost. It wasn’t enough. She sold possessions, fought for and lost her home on Pine Island, and filed for bankruptcy. Cesare is among the millions nationwide who lost their jobs, their savings and their homes. The Great Recession threw about 11 million people out of work and gobbled up $13 trillion in wealth as the stock market crashed and home prices fell into the basement. Whole neighborhoods changed as once-manicured lawns and well-maintained homes turned into worn derelicts with greenish-black pools, torn screens and hip-high weeds. Throughout Florida, other communities experienced the same fall. But Southwest Florida fell the hardest: For a while, Lee County became the foreclosure capital of the nation, leading other metro areas in the so-called sand states of Florida, California, Nevada and Arizona. It also became a stage for politicians such as President Obama, Mitt Romney and Sen. Bill Nelson; and major news organizations such as The New York Times and the New Yorker, who dropped into the area to report on a disaster in progress. In three years, the unemployment rate in Lee County zoomed from 3.3 percent to 13.1 percent – nearly a 300 percent increase. It wasn’t just a bigger number, it was thousands of neighbors losing their jobs. People who held down stable jobs for years suddenly found themselves in breadlines. The official keepers say the Great Recession started in December 2007 and ended in June 2009. In reality, the pain lasted far longer and still has lingering effects. Ten years after the start of the worst downturn since the Great Depression, many are still clawing their way back. Some people held on to homes that are still underwater, meaning they owe more on their homes than the homes are worth. Some are working but at jobs that pay less. Many college graduates who tried to join the workforce during the downturn have had their earnings and career prospects stunted. And some older workers gave up and retired early. Some of those effects are masked by the long recovery, which has been gaining speed in the past few years: the stock market is soaring, consumer confidence is up, jobless rates are low and the economy is growing again. Even home prices have recovered, but not to the high levels of the boom, which Realtors say is a good thing. The main thing, they say, is not to revisit the sins of the past. The recession was born through a mix of bad management, easy credit, too much debt, greed, fraud, and lack of regulation and oversight, especially concerning a strange group of unregulated financial products, including some that were essentially bets on bets, according to the bi-partisan Financial Crisis Inquiry Commission. It was like an infection: Main Street was pulled into the mess that Wall Street made, and many people who didn’t get big bonuses, who didn’t take out multiple loans, who didn’t do anything extravagant, who played it honestly, ended up losing their jobs and their homes. Many went bankrupt. It wasn’t their fault, but it was their problem now, their loss, their pain. Still, before the downturn was over, those who didn’t want more regulation of the financial industry created a new narrative: Government was to blame, in part for policies that pushed too many people who couldn’t afford houses into home ownership. Borrowers were to blame for getting in over their heads and then looking to the government to save them. And the government’s response was all wrong: pushing bailouts, “failed stimulus” and regulations that would hurt the recovery. In reality, economic reports say the measures taken by the Bush and Obama administrations helped shorten the recession, kept it from becoming far worse and pumped up the economy during a time when it badly needed the boost. And much of the money has been paid back. Then he started offering a similar tour by pontoon boat. At the time, Lee County was the epicenter for foreclosures, and some people accused him of preying on the misery of others. 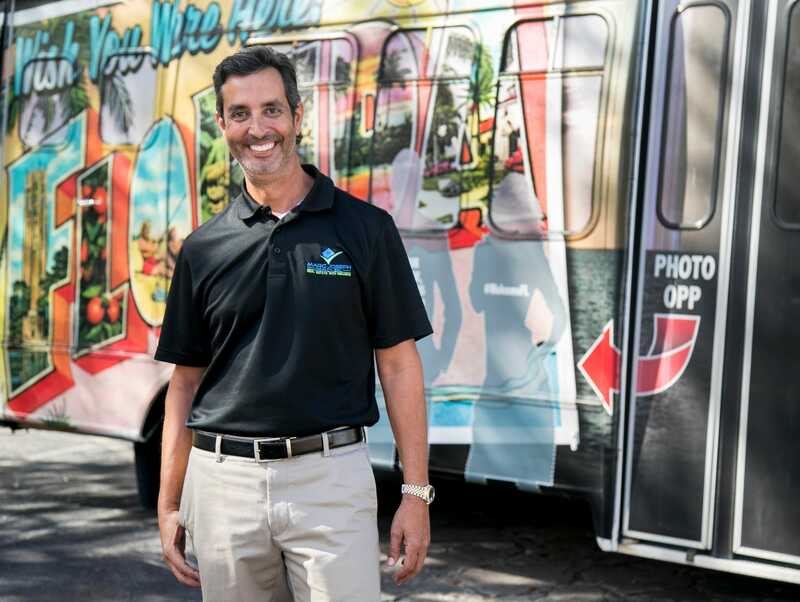 Fort Myers Broker Marc Joseph used to have Foreclosure Tours R Us on the side of his bus. He now has a more positive vibe to match the current real estate market. He lost that million-dollar home and had to close some offices. He likened the heyday of the housing boom to a casino. “The first round of musical chairs that went around, the people who bought with one thousand dollars down and never even took possession of the house, they made a lot of money, if they walked away from that table – from that gambling table – because that’s what that was,” Joseph said. Builders stopped building. Home prices started going down. People stopped paying their mortgages and walked away from contracts for new homes. Builders started to fold. And that once-hot market became a foreclosure market. Joseph is listed high in the credits of the 2014 film “99 Homes” starring Michael Shannon and Andrew Garfield. The movie shows haunting scenes of a real estate agent showing up with sheriff’s deputies to tell homeowners they no longer owned their homes and had to leave. Joseph lived those scenes and shared his own videos of evictions with the movie’s director. 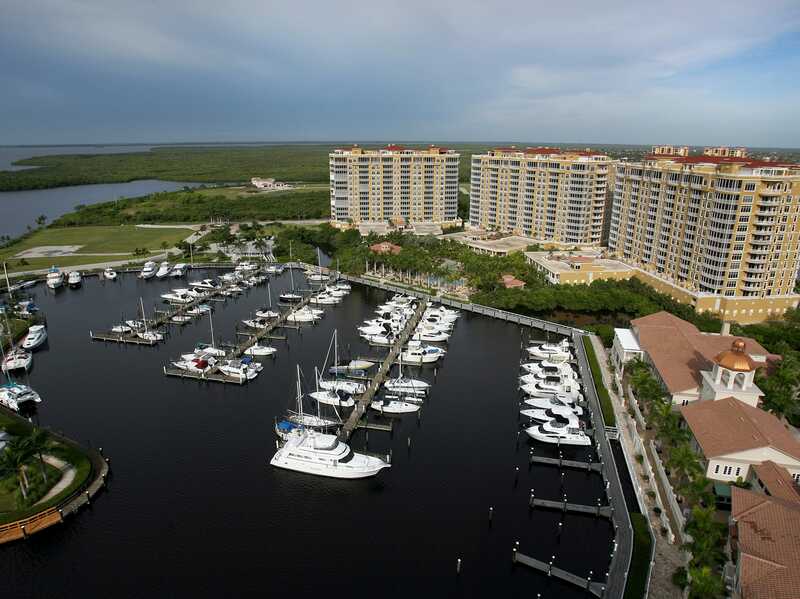 A penthouse view from The Resort at Marina Village luxury hotel of the Tarpon Point Marina basin, shops and Tarpon Landings, a trio of high-rise condominiums that recovered after the overall development became part of one of the biggest foreclosures in Southwest Florida history. The median sales price for a home in Lee County peaked at $322,300 in December 2005, but had fallen to $215,200 just two years later. That’s a 33.2 percent drop in two years. That kind of drop is what pushed so many homes underwater at the same time people were losing their jobs – and hurt their ability to make mortgage payments. Many just walked away. Lee County set up a team of judges to run its “rocket docket” of foreclosure cases. “It was no longer a resale market,” Joseph said. “You went after banks. There were 23,000 cases backlogged. In October 2008, the county rammed twenty-six hundred court cases through foreclosures, twenty-six hundred in one month! So I’m on the bus trying to tell people to buy.” By contrast, foreclosures were well under 100 a month in Lee and neighboring Collier County in the first part of 2006 and earlier. Those who did buy then made a lot of money. Hundreds of homes were snapped up by big investment companies seeking income and future gains from appreciation. Now that those investments have paid off, Joseph warns that some of those companies could start dumping hundreds of homes at a time on the market, depressing prices. The median sales price for a house in Lee County is now $238,350, down slightly from a year ago. It’s $244,185 in Florida, up about 8 percent. Stability is good. The market is much healthier these days, said Tumbarello, who tracks foreclosures. “An oldtimer said to me something that really hit. He said, ‘We’ve had these crashes up and down, but this is the first time we’ve ever built 10,000 houses for the heck of it’,” Tumbarello said. “We built all we needed and then some for six years. The neat part is it’s all absorbed now. “Since 2015 we’ve been under 100 (foreclosures) a month for the most part every month and I think that’s the normal until we lose our minds and over-lever again,” he said. “If the economy takes a hit and there’s an impact to employment, I think you’ll see a slight rise, but I don’t see how we’d get to twenty-seven hundred a month without bringing back no-doc loans.” And experts say that isn’t likely to happen. About five years ago, Joseph converted his green foreclosure bus to a welcome center concept. Now the bus sports a paradise vibe. Nicole DePuy had a trial loan modification under the government’s Home Affordable Modification Program that should have stopped the foreclosure and sale of her Cape Coral home. It didn’t work that way and a developer bought her house and she had to move out. One Friday morning in 2009, Mark Morris received a sealed letter from federal regulators. It said this would be his last day running Commerce Bank of Southwest Florida. It was Nov. 20, and that afternoon, 75 people swarmed into the Fort Myers-based bank. One official told him to leave. It ended more than a yearlong struggle to turn the bank around. “When Wall Street collapsed and the secondary market went away, that’s what really hurt my bank,” Morris said. He said the bank did a good job of assessing risk and making loans. Still, when the recession hit, there were too many loans going bad and not enough capital. Commerce Bank became one of more than 70 banks in Florida to fail during the downturn, and one of about 450 nationwide. It was a bloodbath for community banks. Commerce was bought by Minnesota-based Central Bancshares and reopened that Monday as a different bank. To most people who banked there, it was a hardly noticeable blip. Central was snapped up by MidWestOne Bank in 2015. To Morris, it was the end of his banking career. In the years since, he’s carved a niche for himself in commercial real estate. He’s an advisor with VIP Commercial Realty in Fort Myers. He took a tough hit to his personal finances, losing hundreds of thousands of dollars. Morris and his banking friends felt he had done it right with Commerce Bank: one location, keep the asset base small, work to get it profitable. Other bankers fared worse. Some went to prison or were sued by investors. Jerry Williams, the former president of Naples-based Orion Bank, was caught in fraud, trying to make it seem like his bank had more capital than it did to prevent a government takeover. He spent six years in prison. In all, Lee and Collier counties lost 10 community banks and have added none since the downturn ended. The story is similar in other areas of fast-growing Florida. Local bankers and other critics say that Dodd-Frank regulations to curb abuses and limit the effects of another financial meltdown are too tough on smaller community banks and should be amended. Some economists and consumer advocates say they could support that. Still, Yana Miles, senior legislative counsel with the Center for Responsible Lending, said American taxpayers need to be wary of politicians bringing “regulatory relief” bills to the House and Senate. Some recent bills would curb the powers and independence of the Consumer Financial Protection Bureau, which was set up in 2011 to operate free of pressure from politicians and industry lobbyists. “It’s the one agency that was specifically designed to look out for Main Street,” Miles said. “It seems that some in leadership may have forgotten this crisis, but we haven’t and everyday people haven’t, because we’re still coming out of it. People want protection. Recessions in the early 1980s and 90s had come and gone quickly. The Great Recession was longer and deeper than most experts predicted. The S&P 500 index fell by more than half from August 2007 to March 2009. But the stock market bounced back and has recently reached record highs. Now the question is: Have we truly recovered? The signs are mixed, but mostly positive. People are saving less and spending more, which has some worried that we may be getting back to our pre-crash ways. The savings rate in December slipped to 2.4 percent but was as high as 6.6 percent when the Great Recession “ended” in June 2009. Yet people are spending more because they are more confident and have more to spend. Personal income grew in 2016 in 2,285 counties nationwide and fell in 795, according to recent estimates by the U.S. Bureau of Economic Analysis. When the recession took hold in 2007, the real median income fell for five straight years. It bottomed out at $53,331 in 2012. It has since climbed to $59,039 in 2016, the highest yet. Employment always drags even as other parts of the economy recovers. When President Obama took office in January 2009, the unemployment rate was 7.8 percent. It would keep climbing until reaching its peak of 10 percent in October 2009. It would take until mid-2015 for unemployment to fall to its pre-recession average. But now it’s 4.1 percent, lower than it was before the recession began. What was different about this downturn was that so many people were out of work for so long: The long-term jobless rate (those unemployed for 27 weeks or more) rose to an all-time high of 4.4 percent. And the number of people working part time who would prefer to be working full time doubled to 6 percent from the pre-recession average. Sue Cesare didn’t go down without a fight. She worked four jobs. She worked with lenders to get a remodified home loan and lower payments. She hired a lawyer to fight the foreclosure. Through everything, she kept working, with the main goal of saving her home. Unlike the speculators, she had a lot to lose: She had put $100,000 down on her $227,000 home. Her lawyer was able to delay the foreclosure for months, but he warned her that she would eventually lose the home. Early in the downturn she got a job as an on-call postal worker on Pine Island. It wasn’t many hours at first, but it had the potential to grow into a full-time job. 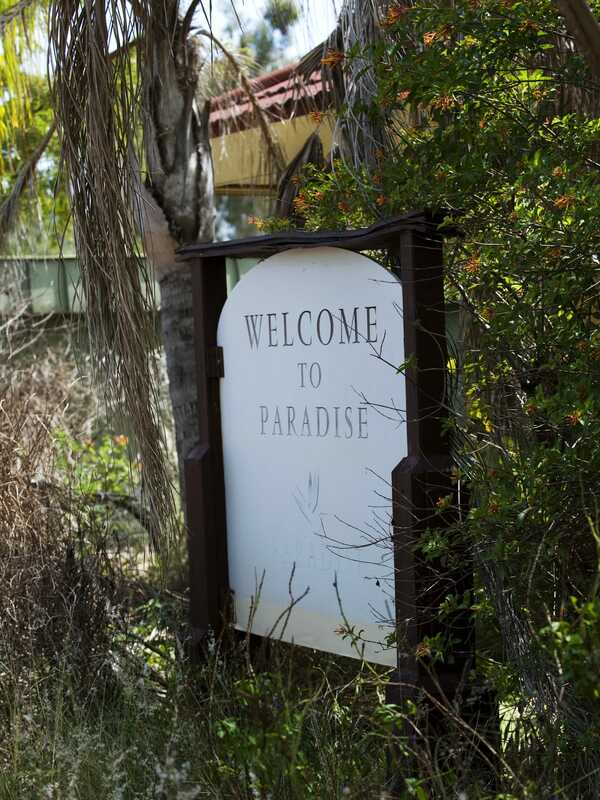 The welcome sign at Paradise Preserve in North Fort Myers stands welcoming no one. Paradise Preserve, formerly Lochmoor Country Club, has been closed for years due to foreclosure. She worked as a landscaper, a house cleaner and a real estate agent, all while continuing to hold onto her part-time mail carrier job. She invested in an old Jeep to navigate the rough roads on the island. Meanwhile, she kept looking for other work. She thinks the foreclosure and her eventual bankruptcy affected her chances of landing jobs. She tried for two jobs with the Military Sealift Command, which supplies Navy ships at sea with everything they need. Two representatives interviewed her and focused their questions on her mortgage default. She didn’t get hired. “I was crushed, not to mention I was out almost 600 bucks,” she said, which was spent on getting various clearances. A similar thing happened with an assistant manager position at an auto dealership. Then she finally lost the home. She had to move out by Dec. 1, 2011. Once out, Cesare bounced around many apartments and a trailer trying to find a decent and affordable place to live. She eventually landed a full-time job at the post office with benefits in May 2014. But she retired a year later. She knows some people may question that decision. Her back had been killing her for years because of all the weight mail carriers handle. She had back surgery in 2017. Now she’s on Social Security and, with the help of family, owns a small condo in Fort Myers. She worries she won’t be able to do the things she planned to do. 1. Two bubbles: a housing and a bond market bubble. People seeking more return than what they could get from Treasuries bid up riskier securities, such as those based on subprime mortgages. 2. Too much leverage, meaning debt, handled badly. 3. Lack of adequate regulation, such as on the shadow banking system. 4. Disgraceful practices in subprime mortgage lending. 5. Complexity run amok. Investments most people couldn’t understand. 6. Overrated rating agencies. Too many triple A ratings on questionable securities. Who pays for the ratings? Why, the companies issuing the securities. 7. Crazy compensation systems. Financial industry folks were paid more for taking big risks with other people’s money. About this series: Over the next 10 days we are examining the impact and lingering effects of the Great Recession. This entry was posted in Industry News and tagged Great Recession, real estate, Real Estate Law, SWFL economy. Bookmark the permalink.